Objectives The fit note, introduced in England, Wales and Scotland in 2010, was designed to change radically the sickness certification process from advising individuals on their inability to work to advising them on what they could do if work could be adapted. Our review aimed to evaluate the following: (1) Is the ‘maybe fit’ for work option being selected for patients? (2) Are work solutions being recommended? (3) Has the fit note increased return to work? (4) Has the fit note reduced the length of sickness absence? We considered the way in which outcomes vary according to patient demographics including type of health problem. Methods Studies were identified by a systematic search. We included all studies of any design conducted in the UK with working age adults, aged 16 or over, from 1 April 2010 to 1 Nov 2017. Risk of bias was assessed using a modified Newcastle-Ottawa Scale. Results Thirteen papers representing seven studies met inclusion criteria. In the largest study, ‘maybe fit’ for work was recommended in 6.5% of fit notes delivered by general practitioners (GP; n=361 801) between April 2016 and March 2017. ‘Maybe fit’ recommendations were made in 8.5%–10% of fit notes received by primary care patients in employment, and in 10%–32% of patients seen by GPs trained in the Diploma in Occupational Medicine. ‘Maybe fit’ was recommended more for women, those with higher socioeconomic status, and for physical, as opposed to psychiatric disorders. The majority of fit notes with the ‘maybe fit’ option selected included work solutions. There was inconclusive evidence to suggest that the introduction of the fit note has reduced sickness absence among patients in employment. Conclusions Fit notes represent a major shift in public policy. Our review suggests that they have been incompletely researched and not implemented as intended. 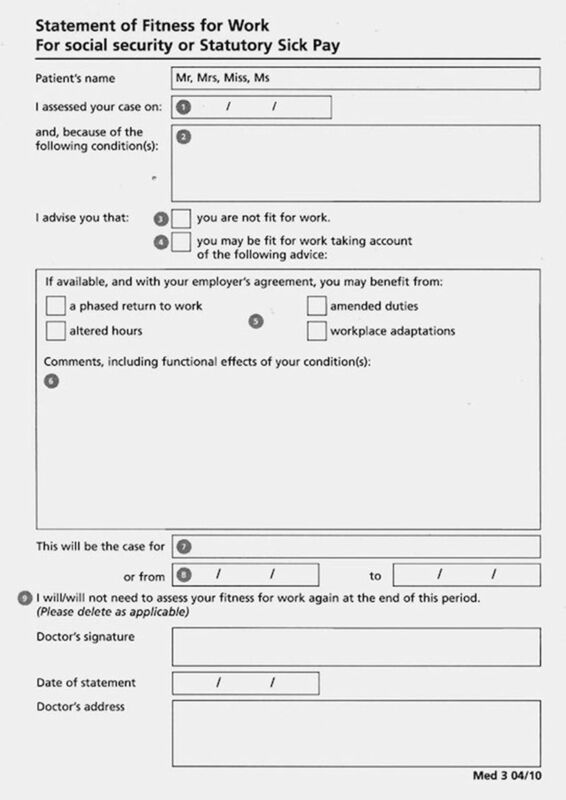 The fit note, introduced in England, Wales and Scotland in 2010, was designed to radically change the sickness certification process from advising on individuals’ inability to work to emphasise what they may be able to do if work solutions were made available. This is the first systematic review of the literature evaluating the implementation and impact of the fit note. Our review has found little quantitative research into the impact of this major policy change. Available research suggests that fit notes have been incompletely researched and not implemented as intended; the results are inconclusive. The largest study found that 6.5% of fit notes had ‘maybe fit’ recommended. Across all studies, the majority of fit notes with ‘maybe fit’ recommended included work solutions. On the basis of available evidence, it is unclear whether fit notes would, if properly implemented, give a desired change for patients. Evidence suggests that fit note implementation could be improved by legislation which encourages employers to adapt to the needs of patients. Low-cost staggered implementation could be used to evaluate the impact of future policy change on patients. The fit note expands the ‘fit to work’ or ‘not fit to work’ options, by including a third ‘maybe fit’ option. In addition to this third option doctors and patients are invited to indicate circumstances under which the patient could work,11 and to identify potential ‘work solutions’, similar to partial sickness absence. These ‘work solutions’ include a graded return to work, altered hours, amended duties and workplace adaptations.12 13 The fit note is designed to enable the GP to be an advisor on work, rather than an adjudicator,14 the GP can provide guidance for the patient and the employer. The fit note also has a role in providing evidence of long-term sickness absence in applications for employment and support allowance. Importantly, GP ‘maybe fit’ advice and work solutions on the fit note do not prevent individuals from obtaining benefits. Initially, the fit note completely replaced the sick note only in primary care, followed by its introduction in secondary care settings. To support this major shift in UK policy, the fit note was introduced with a specially designed national educational programme for GPs, distinct from the broader Diploma in Occupational Medicine (DipOccMed) also available to GPs.15 The introduction of the fit note coincided with the development of a government-funded ‘Fit For Work’ (FFW) pilot scheme which delivers general health and work advice to employees, employers and GPs via a website and telephone line; the scheme is currently undergoing major changes due to a lack of uptake.16 17 There have been numerous publications guiding GPs, employees and employers on how best to use the fit note.18 19 Previous studies have explored the acceptability of fit notes for GPs, employers and patients.20–22 A recent UK government white paper published in November 2017, Improving Lives: The Future of Work, Health and Disability,17 has drawn attention to the fit note, and raised questions about its future. 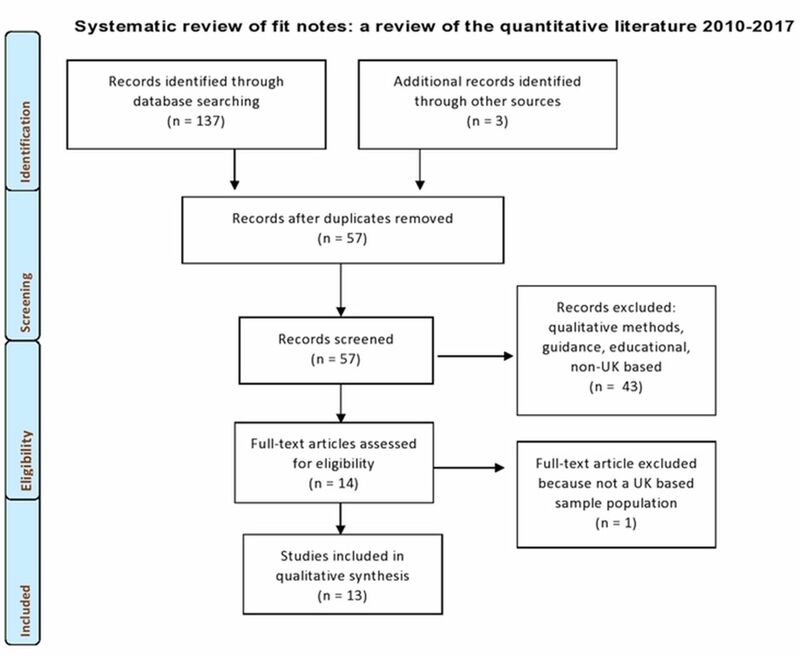 This is the first systematic review of the literature evaluating the implementation and impact of the fit note. We aimed to address whether the fit note is meeting its stated aims: (1) Is the ‘maybe fit’ for work option being selected for patients? (2) Are work solutions being recommended? (3) Has the fit note increased return to work? (4) Has the fit note reduced the length of sickness absence? We consider the way in which outcomes vary according to patient demographics including type of health problem. The review is reported according to the Preferred Reporting Items for Systematic Reviews and Meta-Analyses (PRISMA) group.23 The search strategy can be found in online supplementary files 1 and 2. We searched Embase, Cochrane CENTRAL, Medline, HMIC, Social Policy and Practice, PubMed and PsycInfo from 1 April 2010 to 1 November 2017. The search terms were ‘fitnote(s)’ or ‘fit note(s)’ or ‘fit-note(s)’. Studies were included if they were reported in English and the study population was working age adults (16–65) in England, Scotland or Wales. We included any study design that reported one of the following outcomes: (1) the use of ‘maybe fit’, (2) work solutions on fit notes, (3) changes in return to work, and (4) length of sickness absence after the introduction of the fit note. We excluded qualitative studies and case series. Two authors (SD and ER) initially assessed the titles and abstracts identified by the search and reviewed the full text of the remaining articles for inclusion. Any discrepancy was resolved by discussion, and where agreement could not be reached a third author (MH) was consulted. All relevant references were checked for additional citations. Two authors (SD and ER) extracted the following data from each study using a data extraction proforma (see online supplementary file 3): the first author’s last name, publication year, country or region where the study was conducted, study period, sample size, number of participants, funders, whether exclusions were made, effect sizes and 95% CIs for our outcome variables: ‘maybe fit’, work solutions, recommended length of sickness absence and return to work. Two authors (SD and ER) used a 10-point quality assessment tool adapted from the Newcastle-Ottawa Scale24 for non-randomised studies to assess risk of bias. This scale is used to assess the methodological quality of observational studies and has acceptable validity and reliability. Methodological considerations in each cross-sectional study were scored as follows: 0–5 points for adequate selection of study subjects, 0–2 points for adequate comparability of study subjects, 0–3 points for adequate outcome assessment. For longitudinal studies, there were two additional points, one for length of follow-up and one for adequacy of follow-up. Overall study quality for cross-sectional studies was scored as follows: 0–3=low quality; 4–7=medium quality; 8–10=high quality. Longitudinal studies were scored 0–4=low quality, 5–8=medium quality, 9–12=high quality. Preferred Reporting Items for Systematic Reviews and Meta-Analyses (PRISMA) diagram. We report findings in relation to the type of study population presented: 11 out of the 13 papers explored the use of the fit note in primary care, 1 explored its use by employers30 and 1 by employees25 (table 1). Two of the primary care-based papers analysed the use of the fit note by GPs with a training in the DipOccMed. Seven papers analysed a study funded by the UK government Department of Work and Pensions, three papers were funded by the Institute of Occupational Safety and Health, one was funded by the UK Health and Safety Executive, one was funded by the National Institute of Health Research and the most recent was funded by National Health Service (NHS) Digital. Three papers compared data from ‘before and after’ the fit note’s introduction27 31 33; the remainder were conducted after the introduction of the fit note.25 26 28–30 32 34–37 Four papers were limited to populations of patients in employment. Study sizes ranged from 94 fit notes in the smallest study to 5 million fit notes in the largest.28 37 See table 1 for more information on study design. Two studies analysed fit note use in all primary care patients. In a cross-sectional analysis of GP patients from 68 practices, ‘maybe fit’ was recommended in 6.4% (n=5080) of all fit notes.32 The same patients could receive multiple fit notes—when this is taken into account, 12% of all patients receiving fit notes had a ‘maybe fit’ recommendation at least once (n=2990).31 32 These findings were replicated by NHS Digital: 6.5% of patients receive a ‘maybe fit’ recommendation in over 5 million fit notes. Six papers analysed ‘maybe fit’ use among employed patients. After excluding one study which intentionally oversampled fit notes,28 we found the prevalence of ‘maybe fit’ ranged from 7% to 10% of all fit notes. Gabbay et al restricted primary care study 6 to include only GP patients who were known to be in employment because employment was recorded by the GP (32.5% of fit notes, n=25 061).33 In this population, 8.5% (2151) of fit notes included a ‘maybe fit’ recommendation. Shiels et al 35 defined the employed population by excluding patients recorded by their GP as ‘not in work’ (7%, n=2315 patients with 3468 discrete episodes). Patient episodes were analysed, rather than individual fit notes. In 91% (n=28 588) of first episodes the GP recommended that the patient should abstain from all work. In the remaining 9% (n=2865) the episode had concluded with the GP advising that the patient ‘may be fit’ to work provided adjustments were made to normal working conditions. Coole et al used a sampling method which intentionally oversampled ‘maybe fit’ notes.28 GPs were asked to record the first 10 ‘new’ fit notes issued to employed patients including a minimum of five ‘maybe fit’ notes. As expected from this sampling strategy, ‘maybe fit’ use was over-represented in their sample, 27%25 of all fit notes. The most recent study found that between 2016 and 2017, a third of fit notes (33.6%) were for 5 weeks or longer.37 Two ‘before and after’ papers analysed the same cohort of GPs and patients from 2001 to 2002 and 2011–2013 to explore changes in length of sickness absence, before and after the introduction of the fit note.31 33 Shiels et al 31 found no change in long-term sickness absence across all seven GP practices. Gabbay et al 33 studied the same population, restricted to the 31% of patients whose occupation was recorded by the GP, with the aim of identifying a patient population in employment. These selected patients were pooled in a multilevel logistic regression analysis, which found a reduction in the risk of a long-term (over 12 weeks) certified sickness episode (OR 0.65 (0.58–0.72))33 for patients who had occupational information recorded by their GP. Using the Newcastle-Ottawa Scale to assess risk of bias in each data source (see online supplementary file 4) we found six papers from the same study were high quality31–35 (table 3). Of the remaining studies five were medium quality25–28 30 and two were high quality.37 Several study designs were mixed methods, their quality score reflects the quantitative section of these papers and is not representative of their qualitative methods.26 28 30 The main limitations in medium-quality studies were low sample size, non-respondents and the representativeness of sample. Two studies defined the primary care population according to employment status and benefit receipt based on GP records, which are known for poor recording of employment-related variables.34 35 We could not test for publication bias due to the limited number of studies in each population: primary care patients, employed patients and patients seen by GPs trained in the DipOccMed. The ‘maybe fit’ option is recommended in only a small minority of patients who receive fit notes in UK primary care.25 27 31–35 Wide variation in practice in the use of ‘maybe fit’ is seen between GP practices and according to GP training and setting.25–35 The highest use of ‘maybe fit’ and advice on work solutions is by GPs trained in the DipOccMed. The motivation behind the introduction of the fit note was to reduce unnecessary sickness absence and improve return to work rates, thereby avoiding the individual and societal costs of long-term sickness absence. The evidence we have reviewed about the impact of the fit note on these outcomes is sketchy. While there is some evidence from before and after studies that the introduction of the fit note reduced sickness absence among patients in employment,27 32 33 return to work outcomes have not been evaluated against the sick note.25 30 These data are from observational studies, and it is impossible to know whether the fit note or other unrelated secular changes are responsible for the observed differences. The results are therefore inconclusive—they support the possibility of a favourable impact, but do not allow more definite inferences to be drawn. We used a robust search strategy and adhered to PRISMA guidelines; however, it is not possible to rule out publication biases, particularly from analyses reported in the grey literature. We avoided summarising the results in a meta-analysis because the numbers of studies in each category were small, and in some cases papers drew from the same study population. While the formal assessment of quality did not unearth significant problems, the studies were generally limited by their reliance on routine and incomplete data—such as patients’ employment status—and the fact that they were universally observational in nature. Ideally, there would have been cluster randomised trials or at least phased introductions using stepped wedge designs to allow the impact of the introduction of fit notes to be understood. The fit note represents a major shift in policy in an area of urgent public interest. It is therefore remarkable how little published research there is on fit notes. The studies we review indicate that it is incompletely implemented, with only a small minority of GPs using the ‘maybe fit’ recommendation and significant variation in practice. While it may have had an impact on long-term sickness absence among patients in employment, the research to date does not do justice to the scale of the problem the fit note was designed to address. It is not clear whether the current system could be more effective or whether more regulatory support is needed. Evidence from Nordic countries suggests that fit note implementation could be improved by legislation to encourage employers to adapt to the needs of patients. Low-cost staggered implementation could be used to evaluate the impact of future policy change on patients. CBI. Healthy returns? CBI/Pfizer absence and workplace health survey. London: CBI, 2011.
. Annual Report of the Chief Medical Officer. Public Mental Health Priorities: Investing in the Evidence, 2013.
. Dame Carol Black’s Review of the health of Britain’s working age population: working for a healthier tomorrow. London: TSO, 2008.
. Vocational rehabilitation: what works, for whom, and when? Great Britain: TSO, 2008:307. Department for Work and Pensions. Health at work- an independent review of sickness absence Dame Carol Black and David Frost CBE. Great Britain: Department for Work and Pensions, 2011. Department for Work and Pensions DoH. Improving Lives: The Future of Work, Health and Disability. Britain: Department for Work and Pensions, 2017.
. Completion of the statement of fitness for work: Concise guidance. Clinical Medicine. Journal of the Royal College of Physicians of London 2012;12:63–6. DWP. Fit For Work Guidance for Employers. London: Department for Work and Pensions.
. An evaluation of the statement of fitness for work (fit note): a survey of employees. Sheffield: Department for Work and Pensions, 2013:116.
. Getting the best from the fit note. Investigating the use of the statement of fitness for work: Report submitted to the IOSH Research Committee, 2015.
. Evaluation of the statement of fitness for work (fit note): quantitative survey of fit notes. London: Department for Work and Pensions, 2013:95. Digital NHS. Fit notes issued by GP practices: December 2014 - March 2017: experimental statistics. Leeds: Digital NHS, 2017.
. The National Statistics Socio-economic Classification: origins, development and use. Basingstoke: Palgrave Macmillan, 2005:112. Bevan KSVSS. Fluctuating conditions, fluctuating support. London: The Work Foundation, 2015.
. Dame Carol Black. The report on Attitudes and Barriers to Employment in HIV-positive patients. Occup Med 2010;60:415–7.
. National Primary Care Research and Development Centre. General practitioners' attitudes towards patients' health and work. Great Britain: Department for Work and Pensions, 2011.
. Employers wary of new ’fit note' design. People Management, 2010:9. Contributors The authors jointly conceived the study question and designed the review. SD and ER conducted the review. SD, SH, IM and MH planned the review. SD and ER assessed the titles and abstracts identified by the search and reviewed the full text of the remaining articles for inclusion. Any discrepancy was resolved by discussion, and where agreement could not be reached MH was consulted. SD drafted the text, which was commented on by ER, SH, IM, AM and MH. Funding SD is funded by the Donald Dean Fellowship in Occupational Mental Health from the Royal College of Psychiatrists. This paper represents independent research in part funded by the National Institute for Health Research (NIHR) Biomedical Research Centre at South London and Maudsley NHS Foundation Trust, King’s College London and the Royal College of Psychiatrists. Disclaimer The views expressed are those of the author(s) and not necessarily those of the NHS, the NIHR, the Department of Health, or the Royal College of Psychiatrists.